I will never turn down the opportunity to eat Italian food and I’ve probably eaten the entire menu of most Italian restaurants in Boulder County. Needless to say, I was thrilled when I heard that Zucca, a Louisville favorite, was doing a regional food tour every Wednesday. I had never had a bad experience at Zucca and I knew the food tour would be no different. Each month they focus on a different region of Italy and September was Friuli. Friuli Venezia Giulia overlooks the crisp blue waters of the Adriatic Sea and was mainly influenced by the Slavic culture. Friuli cuisine is known for its simple recipes and genuine ingredients that create mouth-watering specialties. Upon arriving to a packed restaurant, Jake and I were immediately greeted by out waiter for the evening, Theren (I may have spelled his name wrong). Without needing to convince us too much, he gave us a detailed description of what the regional tour would give us. We were already sold. After quickly gobbling down two baskets of warm and moist Foccacia, I couldn’t wait for my actual meal. 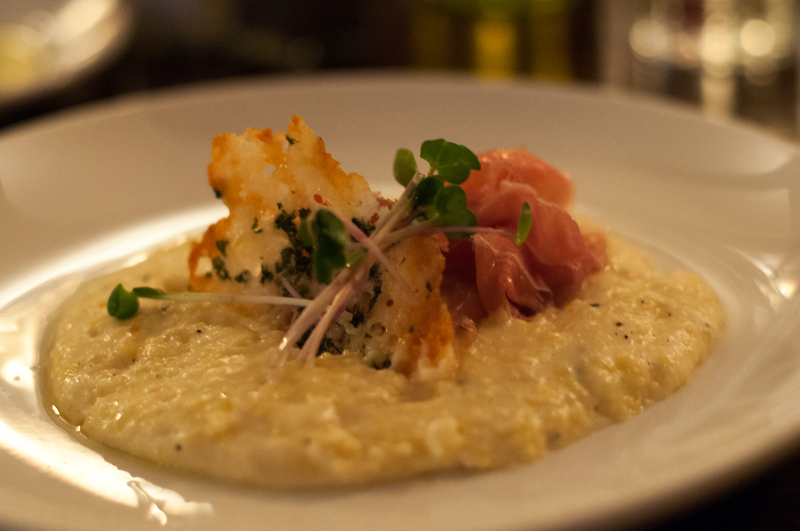 The first dish was Polenta Friulana, which consisted of creamy polenta, prosciutto di Danielle and a frico chip. I should tell you that I am rarely a fan of polenta but after I licked my plate clean, I think it’s safe to say I’ve been converted. The polenta was perfectly creamy, the prosciutto was delightful and I was having a hard time believing there were still 2 more courses. There were two choices for the entrée so Jake and I each ordered one and shared. My dish was the Gnocchi di Susino: potato and plum dumplings, perperonatta and Montasio kipfel. I have always had a weak spot for Gnocchi but I’ve found that oftentimes restaurants overcook it, making it gluey. 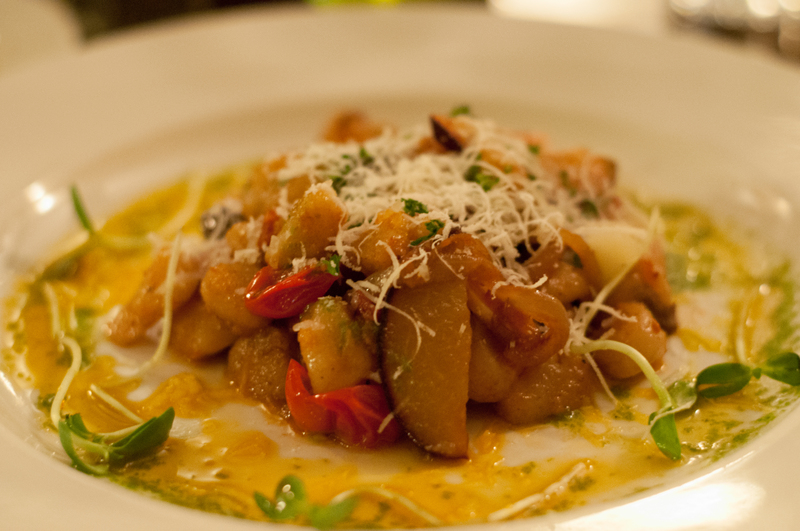 The chefs at Zucca, however, really know how to make their gnocchi. It was perfectly tender and moist resulting in me devouring the entire plate despite already being full. 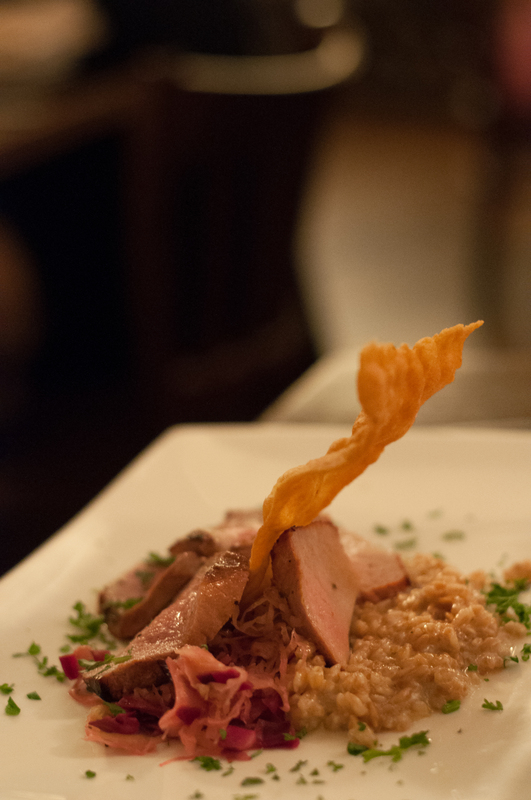 Jake had ordered the Kaiserfliesh Goriziano, which was smoked board accompanied with Three leaf farm sauerkraut, barley risotto and horseradish crostoli. I barely even got in a bite of his before the plate was empty. As with the Gnocchi, everything was cooked to perfection and I wouldn’t be able to tell you which was better. The ingredients that were used created flavor combinations that I had never tasted before and my taste buds certainly approved. I was starting to think that I wouldn’t be able to eat dessert until I actually laid eyes on it. 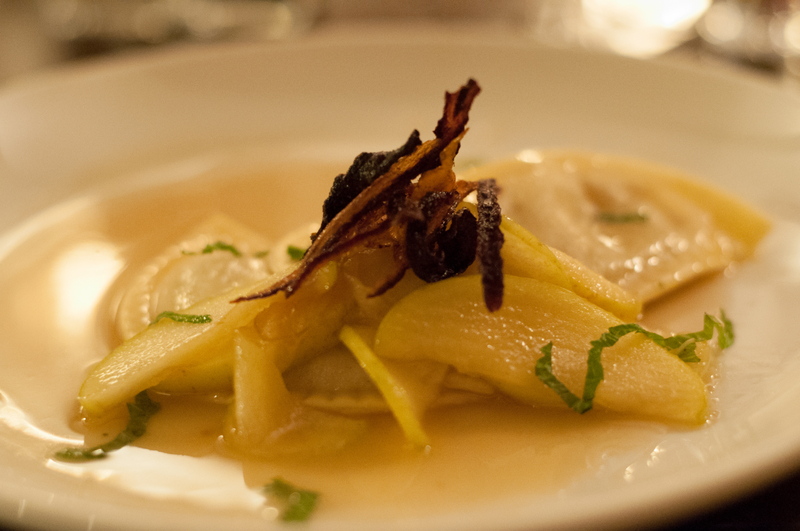 Dessert was Agnoletti alla carnia: fresh pasta, walnut, raison and marsala filling with a brown butter apple sauce. I had never experienced dessert pasta before I was ready to try it. The dish was an ideal fall dessert. It wasn’t too sweet and it left you feeling warm and full. The meal was stick-to-your ribs fantastic. I spent the rest of the night saying I would never eat again but now that I’ve digested, I think I’ll be heading back to Zucca on a Wednesday in the near future. Located on main street in Louisville, Zucca is a restaurant that you need to check out. Every Wednesday for $25 a person, you can take a 3-course tour of the region of the month. While September may be gone, October brings the month of Lombardy.